Earn customer loyalty and make more money by removing more stains. 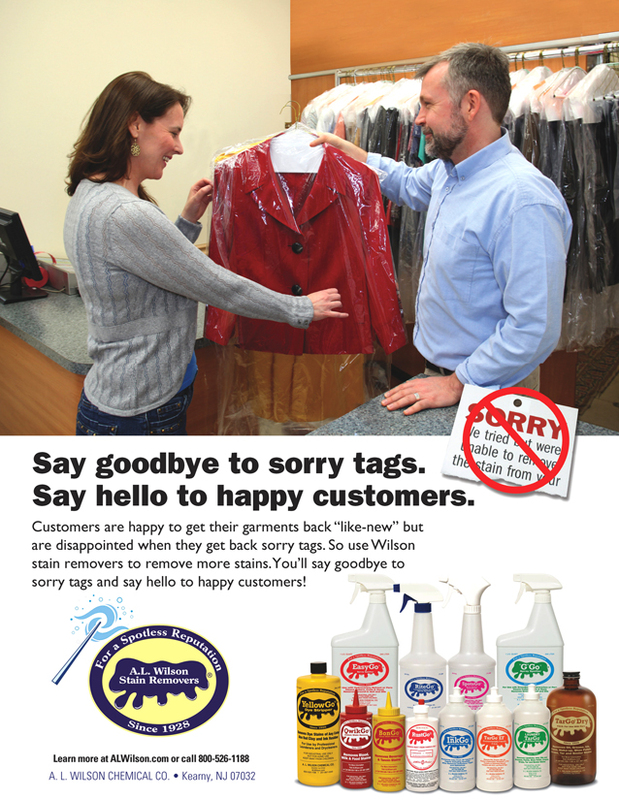 Your customers want to receive their garments and linens back like new. Wilson Stain Removers are great tools to use to deliver the quality your customers are looking for. Wilson’s effective and safe stain removers will help you achieve a spotless reputation. Stain removal is an integral part of the quality service your customers desire. Think of a three-legged stool as a good analogy for drycleaning or laundry. The first leg of the stool represents proper cleaning, the second leg represents correct finishing and the third leg of the stool represents complete and safe stain removal. If any one of these legs is missing, the stool will topple. A cleaner or launderer who fails to remove stains fails his customer as surely as a two-legged stool falls over. Wilson is committed to providing you with the high value tools you need to meet the quality challenge. Our products pair high levels of effectiveness with equally high levels of safety for material color and tensile strength, so that you can remove more stains completely and safely. Without compromising effectiveness, our newly developed products are also designed to be safer for your workers and the environment. © 2013 A. L. Wilson Chemical Co.